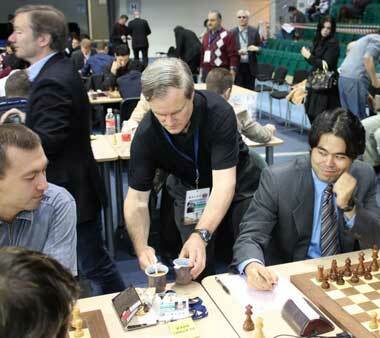 Top seeds dominated the 39th Chess Olympiad held September 21-October 3 in Khanty Mansiysk, Russia. Second seeded Ukraine (averaging 2737 FIDE), led by first board Vassily Ivanchuk's outstanding result of 8 from 10 (a 2890 performance) were deserving winners scoring 19 out of a possible 22 points with eight match wins and three draws in the 11 round competition. Russia 1, the favorites going into the event with an average rating of 2755(! 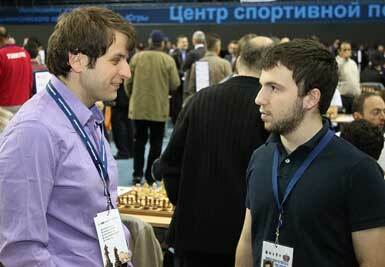 ), were second with 18 points losing only to Hungary in round 5 when Vladimir Kramnik was not playing. These two power houses, who amazingly were both shut out of the medals in both 2006 and 2008, were clearly the class of the field in Khanty Mansiysk and the last few rounds it was quite evident one would be taking home the gold medals and the other the silver. What wasn't clear, up until the last moment, was who would take third. Before the event it looked like any one of a dozen teams might have a chance from third seed China (2703) to number fifteen Poland (2662). The US team, bronze medalists in 2006 and 2008 and second in the World Team Championship earlier this year, were sandwiched in the middle of this group of contenders in ninth place with an average for its first four players of 2692. They knew exactly what they needed to do to medal - play well and use the luck thrown their way - but ultimately just fell short. The US team of Hikaru Nakamura, Gata Kamsky, Alex Onischuk, Yury Shulman and Robert Hess got off to a great start with wins in its first three matches against the Faroe Islands (average 2332) 4-0, Mongolia (2424) 3.5-.5 and Chile (2500) 3-1 before being beaten by Russia 1 (to differentiate them from Russia 2, 3, 4 and 5!) by a score of 3-1. This was the only match in Khanty Mansisyk where the United States was outplayed though Yury was close to winning against Vladimir Malakhov and Hikaru drew as Black against Vladimir Kramnik in one of the best-played games of the Olympiad. This novelty, the result of pre-game preparation by Yury and coach Varuzhan Akobian leaves Black on a precipice. Likely Malakhov, despite a very long think, fails to find the correct answer. 24.Rc5! 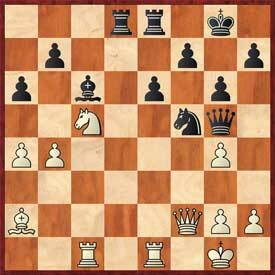 Rfa8 25.d6 (25.Bb5 restricting the knight is not bad either but the text is stronger.) 25...f6 26.Rc7 Kf8 27.Rac1 leaves Black helpless. 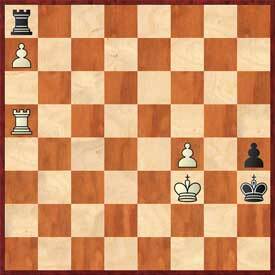 Black is a pawn down but his active pieces save the day. Hikaru continued his excellent form in rounds five and six, winning key games that enabled the US to defeat teams averaging close to 2600 from Argentina and Vietnam by scores of 3-1 and 2.5-1.5 respectively. 39...Kf7 is normal and leads to a draw. The text is a tricky attempt to keep play in the position and try for something more as we needed a victory to win the match. 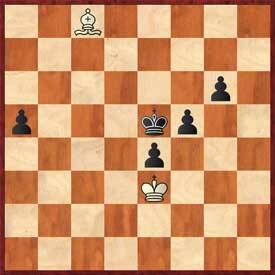 The followup to Black's last move which was not easy to see. Modern chess (and Hikaru!) are very concrete. The text may still draw but simpler was 42.Rcxc2 Rxc2 43.Rxc2 (43.Nxc2?? 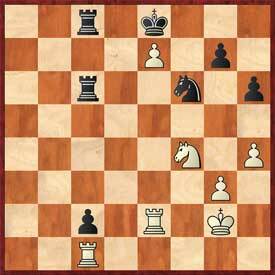 Nf4+) 43...Nxg3 44.Kf3 Kxe7 45.Rg2 drawing. Black has other tries but objectively the position is drawn. The c-pawn continues to live! These wins had the team back up among the leading group with the tournament just over half over. Things looked good but then came disappointing drawn matches with Poland and China. Both of these teams played excellently in Khanty Mansiysk but in each match we had excellent chances to win despite Hikaru and Alex suffering from colds. Judging from the positions we had after three hours we should have beaten Poland 3-1 and China 2.5-1.5. These two missed opportunities gave us little room for error in the last three rounds. 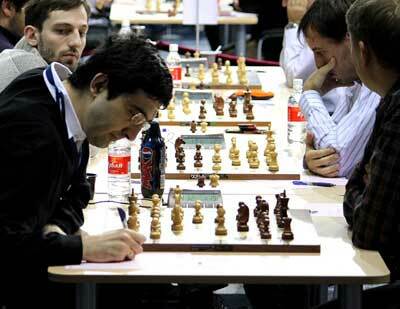 The aggressive Panov-Botvinnik has long been a favorite way of American players to meet the Caro-Kann. 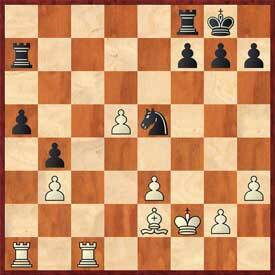 22...g6 23.Qh4 Qc7 24.Qh6 Rfe8 25.Re1 Nd6 26.a4?! Low on time Hikaru starts to drift. 35.gxf5 Rd2 is Black's point. Alex was slowed down in Khanty Mansisyk by a broken collarbone suffered in a triathlon ten days before the event. He didn't play with quite the same energy as his gold medal winning performance on board two in the World Team earlier this year, but ever the professional and team player he lost only one game. 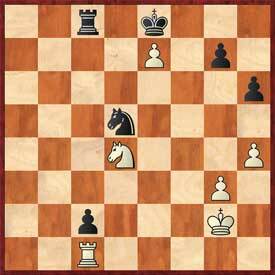 15...bxc6 looks safer, avoiding a well-timed d4-d5. 16.Bxf6 Bxf6 17.d5 exd5 18.Nxd5 Nxd5 19.Bxd5 Rd6 20.Bxb7 Re8? 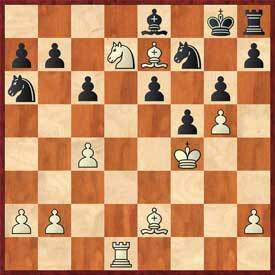 20...Bd4 21.Bf3 Re8 had to be played with some drawing chances (and much suffering in store). The text, the result of pre-tournament work by Yury and Var, prepares...h6. 25.Bf6 h6 26.Bxh8 hxg5+ gives Black three pawns for the piece and a playable position. 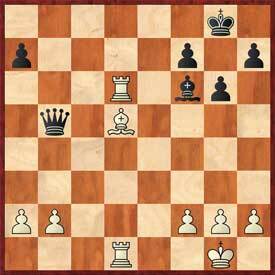 25...Kg7 26.Nxe8+ Rxe8 27.Rd7 e5+ 28.Kf3 Rc8 29.Rxb7 Rc7 30.Rxc7 Nxc7 31.h4 h6 32.Bf6+ Kh7 33.c5? 33.gxh6 had to be played. The text allows Black's knight access to d5 deciding the game. 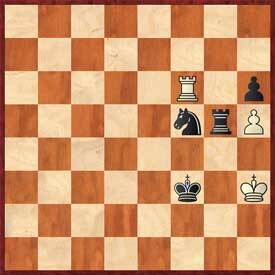 Likely White counted on his c-pawn to save the day but Yury's armada of pawns proves to be unstoppable. The team responded well to the challenge in round nine defeating eighth-seed Bulgaria 2.5-1.5. Hikaru shut down Veselin Topalov by borrowing a page from World Champion Viswanathan Anand, by using Lasker's variation of the Queen Gambit Declined (an inspired suggestion of the US Coach GM Varuzhan Akobian). Gata, as he did on several occasions in Khanty Mansisyk, proved to be the difference by winning a key game against Topalov's second GM Ivan Cheparinov. 1.e4 c5 2.Nf3 d6 3.d4 cxd4 4.Nxd4 Nf6 5.Nc3 a6 6.Be3 e5 7.Nf3 Qc7 8.a4 h6 9.Be2 Be6 10.0-0 Be7 11.a5 Qc6 12.Ne1! The knight is heading to d5 (via d3 and b4) so Black has no choice but to accept. This is the critical moment. 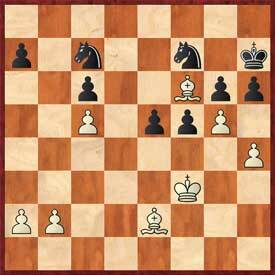 Black might have tried 18...0-0 19.Ne2 (19.Nxe6 was also possible with strong positional compensation for the pawn.) 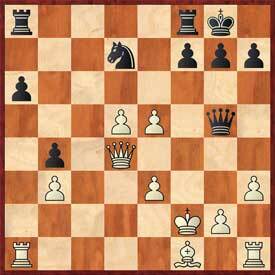 19...Qb2 20.Rb1 (20.Nd4 Nc5 (20...exd4 21.Bxd4) ) 20...Qa3 21.Ra1 Qb2 offering to repeat moves. 45.a7 Bxa7 46.Rxa7 Rf5 47.Qxc6 Rf6 and it is not clear how White makes progress. Gata, the master alchemist, shows a much cleaner path to victory. Tied for fourth, only one winning match out of first, prospects were bright. Our opponent in the penultimate round would be Israel, who we had defeated earlier this year at the World Team. A win and we would be playing for the medals in the final round with a draw likely to give bronze, but such was not to be. It's often said there is no luck in chess but anyone who plays seriously for awhile knows that is not the case. Luck can certainly play a role but taking advantage of good fortune is never automatic though it is essential to a successful finish. The US teams in 2006 and 2008 grabbed all their opportunities but were also blessed with good luck. A result of 3.5-.5 against Ukraine in the final round of Dresden in 2008 happens about as often as Halley's Comet appears but that result in and of itself was not enough for the US to medal. For that to happen four last-round matches had to end with the right result (for the US team). Just one going the other way would have given the bronze medals to another team. The 2010 squad didn't use its opportunities as well as in the past two Olympiads. Consider the following game. Israeli GM Emil Sutovsky had the absolute best result in the Olympiad scoring 6.5 from 8 for a performance rating of 2895. Noted for his outstanding attacking skills Sutovsky was on the top of his game in Khanty showing new-found stability and winning many games cleanly with no risk in a style that must have warmed the heart of his captain GM Alon Greenfeld. The following game between Sutovsky and Gata Kamsky would appear to be a case in a point. Note that this encounter adds new weight to the term "friends and rivals" as Emil is Gata's second and manager when competing in the World Championship cycle. 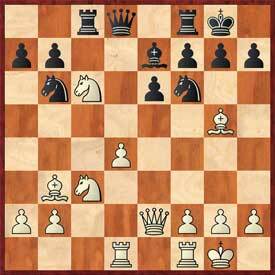 1.e4 c5 2.Nf3 e6 3.Nc3 a6 4.d4 cxd4 5.Nxd4 b5 6.Bd3 Qb6 7.Nf3 Nc6 8.0-0 Nge7 9.Be3 Qc7? 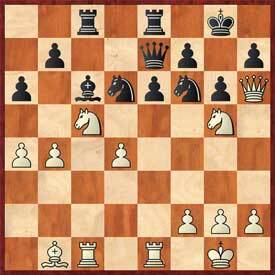 9...Qb8 was necessary but to be truthful the combination of ......b5 and ...Nge7 look like asking for trouble. White must be better here. 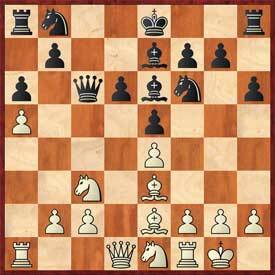 10.Bxb5 Rb8 11.Bxc6 Nxc6 12.b3 Bb7 13.Nd5 exd5 14.exd5 Nd8 15.Re1 Ne6 16.Qd2 Bb4 17.Qxb4 Bxd5 18.Qd2 Bxf3 19.Bf4 d6 20.gxf3 Rd8 21.Rad1 0-0 22.Bxd6 Qc8 23.f4?? 23.c4 and the result would not be in doubt. 23...Ng5! 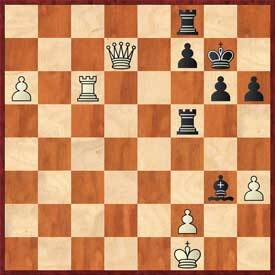 24.Re3 (24.fxg5 Qg4+ 25.Kf1 Qh3+ 26.Kg1 (26.Ke2 Rfe8+) 26...Qg4+ draws.) 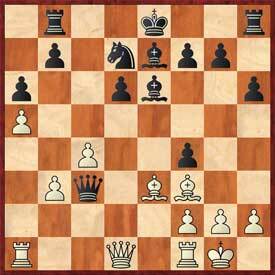 24...Qg4+ 25.Kf1 Nf3 and the final result is anyone's guess. White could lose as easily as Black. Not only did Gata have a chance to save this game, but boards 1, 3 and 4, operating under the assumption that after 10.Bxb5 Israel was winning board 2, dug in their heels and were fighting very hard. At one point all looked better but with nothing concrete. Excellent defensive efforts by the Israelis gave them the match and a last round pairing with Ukraine. Unlike the Women's section where Russia 1 obliterated the competition (11-0!) and had clinched first place before the last round nothing was settled in the Open competition. Before the last round Ukraine was one match point ahead of Russia 1 with several teams in contention for third. 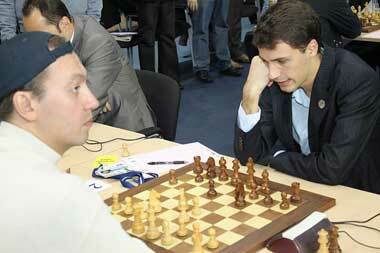 Matters were settled when Russia I's Peter Svidler lost to Salgado Lopez of Spain. With two earlier draws, Russia 1 could at best draw their match (which they did courtesy of a Vladimir Kramnik win over Alexei Shirov). When it was clear that Russia could not win, the Ukrainian team captain, GM Vladimir Tukmakov, offered the Israelis a package draw 2-2 which they had no choice to accept as fourth board Alexander Mikhalevski was in hot water against Zahar Efimenko. One could say this was an unlucky development for Hungary, who lost the bronze medals on tiebreak to Israel. Should Svidler not have lost (or lost later on) Ukraine would have been forced to continue and have been a favorite to win their last round match. Hungary would have earned bronze in that case, but don't forget that Israel beat Hungary in their head to head encounter. An 11-round, 148 team Swiss is not designed to be perfect. All three medal-winning teams should be commended for their excellent play. The strength of the play in the Olympiad may be judged by the fact that world elite Magnus Carlsen and Veselin Topalov lost five games between them and shed over 30 rating points - not an everyday occurrence for players rated over 2800. The US team found itself in the unaccustomed situation of playing a last round match that was not for the medals. Still, the Cuba-US match was a nail-biter that went the distance. All four games were still going well past the first time control and Dominguez-Nakamura was the last game from the Open section to finish. The 2.5-1.5 victory capped an excellent year against the top teams of Latin America teams (a win over Brazil at the World Team and victories over Chile, Argentina and Cuba at the Olympiad). The US started the competition seeded ninth and finished ninth on tiebreak (sharing 5th-10th place.) The five US players collectively played exactly according to their level with no rating change. This was not exactly the over-achieving result the US has grown accustomed to delivering but nor was it a disaster. With just a little bit of luck better utilized it might yet again have been another medal winning result. The US team received excellent support this Olympiad from its sponsors the Kasparov Chess Foundation and US Chess Federation. They not only afforded the team appropriate honoraria but also allowed team members the opportunity to recover from jet-lag in Prague for several days prior to taking the five-hour charter flight to Khanty Mansiysk (this yielded a 3-0 start with 10.5 from 12 game points which has to be one of the best-ever for the US). While the US result might have been acceptable I would be remiss in not mentioning that there are dark clouds on the horizon. Everything short of organizing a pre-Olympiad training camp was done to ensure the team would be able to perform at its best but and yet the future is troubling for several reasons. Why? One need only look around the top 20 tables at the Olympiad to realize almost no players were over 50 and few over 40. Four years from now Gata, Alex and Yury will all be around 40 years old. Playing well at that age was no problem in the past and indeed several standard-bearers of our past teams have played well to almost 50, but times our changing. Yes, there are exceptions like Ivanchuk, Gelfand and Anand who continue to defy the clock, but look for a player over 44 in the FIDE top 50 list and you will find exactly one - Nigel Short number 48 at age 45. This is not a problem for traditional powers like Russia and Ukraine which continue to churn out a steady stream of never-ending talent nor is it an obstacle to rapidly improving countries like China, Azerbaijan and France, but it is for the United States. Go to the latest FIDE rating list and you will find two Russian players over 2700 under 21 and another half dozen over 2600. Yes Russia is quite a measuring stick but look at France with three players over 2600 FIDE or Vietnam and Norway with two apiece. The US has no one. Granted Robert Hess at age 18 and 2596 is not far away and Ray Robson could easily be there soon but after that the US has few comparable prospects. Yes we have many fine young players but we set the bar lower. A player in the US who is 18 and 2500 is considered outstanding but in Russia or the Ukraine they would have been expected to reach that level of strength three or four years earlier. There have been many improvements in American chess the past decade. One can point to increased access to quality coaching, the introduction of a US chess league and more domestic tournaments offering international title norms as substantial progress but there is still much to be done. Outside of the US championship there is nothing for our elite players (Nakamura, Kamsky and Onischuk) to play in the United States that will improve their quality of play and provide them with a steady income. For these players the only answer is to be constantly traveling to Europe or in the case of Italian-American Fabiano Caruana to permanently base one's self there. Yes, it is possible to earn a very decent living coaching, lecturing and writing. All are honorable activities but the fact is that if you want to reach your peak as a player these activities only detract. The precarious situation of top players in the US is not lost on promising American talents and a long list can be made of those who never stuck around long enough to realize their potential preferring a traditional career. It's quite understandable that in the United States where time is precious and the European model of two months of paid vacation each summer is but a dream (likely for them as well in the not too distant future) the weekend Swiss remains supreme. How else can you pack in a bunch of games but to play two a day over ten to twelve hours? This holds true for all players from amateurs to Grandmasters and there is no question that it provides lots of experience and builds endurance. Unfortunately these qualities do not necessarily translate well to the international arena. The World Championship cycle and the Olympiads, the premier events in chess, are played at the rate of one game a day with extensive pre-game preparation. Your typical weekend Swiss whether it be a local or national usually requires rationing one's energy and accepting that with the pairings going up five minutes before the round there will be no time to prepare. The all or nothing mentality required in a system in which a score of 5 from 5 yields a nice prize and 4.5 next to nothing creates a playing style that requires substantial readjustment when confronted with a schedule of one game a day against players of comparable strength round after round. Identifying the problems of American chess in developing and maintaining top players is easy enough - the inability of top players to earn a living in the United States and failure of top juniors to develop as quickly as possible for lack of proper events - but offering solutions is more complicated. One could point to success stories in China, India, Azerbaijan, Vietnam, Russia and Ukraine but all would be difficult to replicate in the United States where there is no history of government support and the cost of living is high enough that playing chess will likely never be a viable career compared to more conventional professions. All this said there are some countries that might provide some answers with France the most intriguing. For much of the 20th century France was one of the weakest chess-playing countries in Western Europe. The contrast between it and nearby neighbors Germany and England could not be more evident - while Germany had strong GMs and fielded strong Olympiad teams throughout its history and England exploded into a world chess superpower in the 1970s and early 1980s - the French only produced their first native born GM (Olivier Renet) in the mid-1980s. Fast forward to 2010 where France is rated number three in the world by country rank by average rating of its top ten players (2653), has as previously mentioned three players under 21 over 2635 FIDE. France finished in the top ten in this Olympiad despite the notable absence of its usual first board Etienne Bacrot. There are plenty of differences between France and the United States, particularly a more favorable chess geography for the former where getting to good tournaments typically involves little or no travelling. Top French players can all but ensure that basic living costs (rent, food, etc.) will be covered by playing in their national league and the Bundesliga in nearby Germany. More "safe" income is available by playing top level opposition in other leagues in Spain and Russia as well as the highly popular European Club Team championship. Cultural differences in regard to vacation time permit French Swisses to be played at a rate of one game a day stretching out over a week. This tempo of play allows for pre-game preparation and lengthy post-mortems that hectic two-game a day weekend Swisses rarely allow. Rival regions throughout France with a strong sense of local community compete with each other to produce better events. 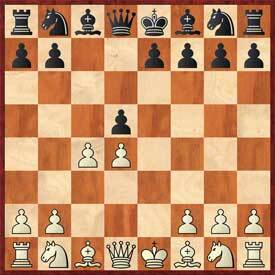 While there are significant differences between the Old and New World chess scenes similarities do exist. Both have similar costs of living to allow for an apples to apples comparison and each has a thriving junior chess community. Both have giant national scholastic championship though they differ in their format with the US model held on a long weekend and the French a week-long-affair over spring break. Interestingly cities throughout France compete for the right to hold these championships and local merchants join together to help sponsor them perceiving good business opportunities to be had by a sudden influx of a couple thousand children and parents to their area. One interesting French innovation is the junior leagues that are arranged by region. Teams are made up of two players under 10, 12, 14, 16 and 18. They play two matches over a weekend and are accompanied by both chaperones and coaches who prepare the kids before the games and analyze with them afterward. This sort of systematic training pays dividends when French kids play in the World Youth championships which have exactly the same sort of schedule. While countries like the US and England will occasionally enjoy an individual success in these events (for example Alex Lenderman, Daniel Naroditsky and Sam Shankland for the United States) the only Western country that really competes with nations from the former Soviet Union, China, India and Vietnam is France. Replicating the French league system, whereby teams meet three times a year over long weekends, would likely be impossible due to the considerable travel costs but the Spanish and Russian models might be viable. They meet over nine consecutive days in one location in a touristic destination - maybe Seattle or Portland in the summer where the temperature is not over 100 degrees? One type of event that has become increasingly rare throughout the world that might address the needs of top players to keep improving, that would provide them with a steady income that didn't require constant overseas trips and which would allow top juniors to develop properly is the round robin. The explosion of top caliber players the past two decades and a drop in the number of round robin events held has made it an organizers market with players under 2725 pretty much stuck with league play and Swisses. The US could take advantage of this situation and help its players with a Grand Prix series of tournaments for elite players and promising juniors. A series of a half dozen ten player round robins, comprised of top US players, specially invited foreigners and top juniors could be realistically be organized at a cost of $50,000 per event. These events would not attract the Anands and Carlsens but might aim for an average rating of around 2650 FIDE. The cost would not be excessive if borne by a series of cities throughout the country. Tournaments could be situated on the calendar so that foreign players could combine them with major US events if they so desired. Organizing such a series of events might not be easy but the alternate is a steady decline of American chess in relation to the rest of the world. This decline would have already been felt a decade ago if not for fortuitous developments that allowed for the return of Gata Kamsky to the chess world and the immigration of Alex Onischuk, Yury Shulman and Varuzhan Akobian to the United States. There is always the possibility of strong newcomers arriving in the future or more "special cases" like a Bobby Fischer or Hikaru Nakamura who develop in spite of and not because of the system, but if we want to repeat our success in Dresden and at the World Team, we should plan ahead now. Look for Olympiad wrap-ups by GM Robert Hess and IM Irina Krush in an upcoming issue of Chess Life Magazine. Photos by Tony Rich of the Chess Club and Scholastic Center of Saint Louis.